At its much anticipated spring unveiling event today in Cupertino, Apple announced the launch of its big Netflix competitor, Apple TV+. The reboot of the Apple TV platform comes with a big slate of new original programming set to start airing this fall, and Oprah and Steven Spielberg were there. That slate includes new scripted shows like The Morning Show, which is all about the inner workings of a morning television program, starring Reese Witherspoon, Jennifer Aniston, and Steve Carrell; Little Voice, a romantic comedy show from J.J. Abrams that's about the world of music; and Amazing Stories from Steven Spielberg’s Amblin Entertainment, which is a science fiction anthology series based on the 1985 NBC show of the same name. Other shows announced, as The Verge reports, include Little America, an anthology series from Big Sick writers Kumail Nanjiani and Emily V. Gordon that's "inspired by immigrants in the US"; two shows from Oprah Winfrey, Toxic Labor, a documentary series about workplace harassment, and a revival of Oprah’s Book Club; See, a future-set sci-fi series from Hunger Games director Steven Knight starring Jason Momoa; and Dickinson, a period show about poet Emily Dickinson. Joining Apple execs on stage at the event this morning were Oprah herself, Carrell, Spielberg, Big Bird, and others. And in addition to the announcements about the streaming platform, the company also announced that the Apple TV app will be coming to smart TVs from Samsung, LG, Sony, and Vizio, and it will be getting added to Roku and Amazon Fire devices as well. 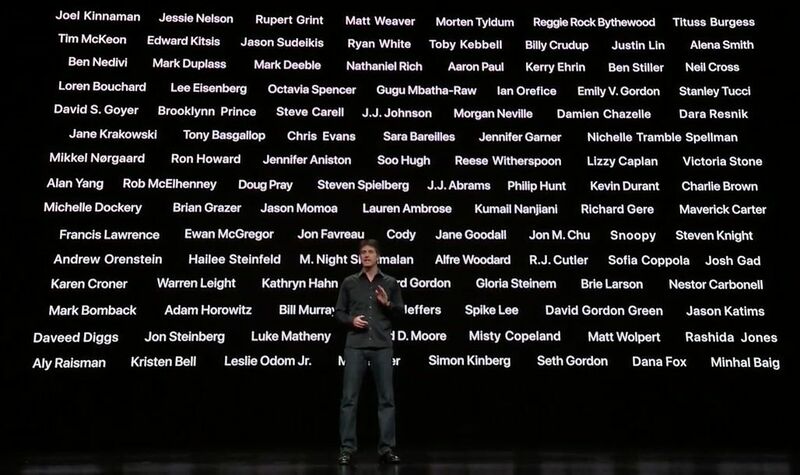 Saying that they want Apple TV+ to become "the destination for the highest quality originals" on TV, the company also flashed on the screen a long list of celebrity names whom they say they've partnered with on upcoming shows. We already knew that It's Always Sunny In Philadelphia creator Rob McElhenny and Charlie Day were working on a comedy series for Apple, but there are way more people to add to that list including Daveed Diggs, Jason Sudeikis, Kristen Bell, Richard Gere, Ewan McGregor, Damien Chazelle, and many more. See the Apple-produced trailer for the new shows, and clips from the event below. And it looks like McElhenny was enjoying an Anchor beer on Apple's dime today with Jason Momoa. If you value your life, do not try to go beer for beer with this man. The hottest name on everyone's mind entering the home stretch toward April's NFL draft is Oklahoma's quarterback Kyler Murray.